OneXelot model "ENIGMA" professional gaming keyboard comes with many different LED color modes! Feel the all unique LED color modes that can be activated by pressing and holding the "FN" key combining with "F1 - F9" keys. Enjoy the variety of options available for the model "ENIGMA" professional gaming keyboard! 1. 19 Anti-Ghosting Keys: "ENIGMA" the professional gaming keyboard featuring 19 anti-ghosting keys for combined moves and action at a time. ▶Semi-Mechanical Keyboard◀ - OneXelot model "ENIGMA" is the newest design revolution which combines rubber-dome membrane keyboard with a switch that gives users more precise and faster response with a clicky sound and mechanical feel. It has been optimized to have the actuation distance and reduce the tolerance for more rapid commands when compare to other rubber-dome keyboards. 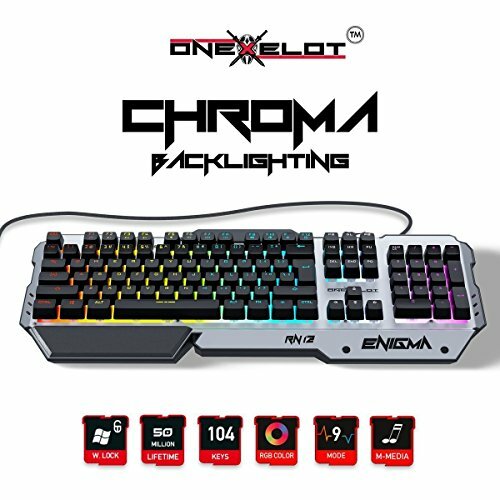 ▶19 Anti-Ghosting Keys◀ - OneXelot model "ENIGMA" the professional gaming keyboard featuring superior 19 anti-ghosting keys for combined moves and action at a time. If you press all your fingers down on a piano, what you'd get is 10 keys ringing out at once. That's what an active anti-ghosted keyboard does too. It ensures that every key you press registers simultaneously and accurately in a game. ▶Breathing Light◀ - OneXelot LED gaming keyboard with backlight has up to 9 different LED color modes. You can experience each LED color mode by pressing and holding FN + Nu.1-Nu.9 keys. Model "ENIGMA" also own ergonomic caps design to maximize the keys press speed and comfortability during the whole day or daily use. ▶Multimedia Functions◀ - Feel the power of 12 multimedia keys available for the model "ENIGMA" gaming keyboard! "ENIGMA" also featuring window's key lock to prevent windows pop-ups during the game. ▶Superior Compatibility◀ - Suitable for most computer systems including Windows 10, 8, 7, XP, VISTA, Mac OS X, and etc. If you have any questions about this product by ONEXELOT, contact us by completing and submitting the form below. If you are looking for a specif part number, please include it with your message.